I think you would weigh the same on Earth as in Micro-Gravity because you would just FEEL weightless but you still weigh the same. I suppose you would be a bit lighter at the top of Jeff’s Peak but not much, as in 5-15 lbs. at most. See, gravity will take a small toll on your weight but not that much. This is simply because the earth’s gravity has a radius of about 3958.756 miles, and since you have said that Jeff’s Peak is only 260 miles high I don’t think it will make you much lighter. I think you would weigh the same. Because gravity is pulling you down when your a the bathroom scale, you will weigh, well, 150. And when your on the mountain, your still in earth’s range so therefore, you will still weigh 150 even a the mountain. I believe that if you are 150 pounds you will be the same amount. I believe my statement because if there’s micro gravity you are the same from earth but it a scale will say your not. I think that you will weigh the same but you will feel weightless. And I think that because there is no place that you are weightless. Because if you are in earth’s orbit you will weigh the same but if you in space you will feel weightless but you are not. In my opinion, his weight on Jeff’s peak would be the same from his weight in his bathroom. I think this because, the amount of gravitational pull determines your weight. In spaces atmosphere there is micro gravity, which gives the weightless feeling. Even though you feel weightless from the micro gravity, you way the same. I think you will weigh the same (150 lbs) because gravity controls your weight. If you are in space you still weigh the same it just doesn’t feel like it. So if you are on the top of a mountain you will still weigh the same because there is still gravity there. If you weigh 150 pound on your bathroom scale at home, you would weigh the same on your mountain. You would weigh the same because you are still in earth’s gravitational pull. If you are anywhere in earth within the gravitational pull then you would weigh the same because gravity is what makes your weight. What will you weigh at the top of the mountain. I think you will be the same weight because it doesn’t matter if your in space you will still be 150 pounds but it just won’t feel like it. I believe that his weight once reached the top of Jeff’s Peak would be no weight. Why I think the person who’d reach the top of Jeff’s Peak would have no weight is because there would be no gravity. No gravity would cause no weight, but you still have that weight you just can’t feel it. I believe that his weight once on top of jeffs peak would be nothing whatsoever because. Like it said in the beginning of the blog they talk about weightlessness and how there’s no gravity. So with no gravity he would weigh nothing at all. I think you would way the same because you would still be in earths gravatoishonal pull….. if the moutin was out of earths grate reach you would be wait less….. If you are on top of a mountain on top and you feel weightless. Well you feel weightless but you are not. You will still be 150 pounds. Nothing will change how high you are. You would still be the same weight and you will still be 150 lbs, the way you will feel is different it would feel like you weigh 0 lbs, so you will still be 150 lbs. Do you know if you go to Mount Everest your weight changes because of gravity I think that it will real the same just that you don’t feel. In space there is zero gravity in space it doesn’t mean that your weight changes I thing you way the same but you don’t feal it because the pressure is different. If your weight is 150 pounds, you would still weigh 150 pounds on your mountain. Jeff’s peak Isn’t out of the earths atmosphere. You might be on a tall mountain, but your still on earth. 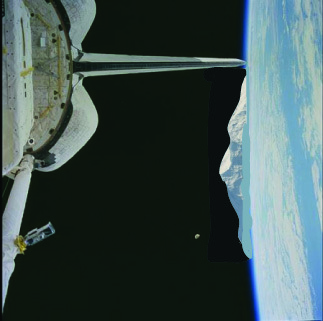 Even a space shuttle might be out of earths atmosphere, but its still in earths gravitational pull. The pull is just weaker than it is on the planet. So you would just weigh the same weight that you did on your bathroom floor. I believe that if you weigh one hundred fifty pounds on your bathroom scale I think you’d be around ten to twenty pounds. I think this because you are technically around 260 miles from the earth so that means your mass should be around nothing because you are around a space station but that doesn’t mean your’e weightless because you still aren’t entirely in space. So that is why I believe you should be around ten to twenty pounds. I think that your weight is going to be less than 150 becuse you are almost out of earths gravety. That is why i think you will weight less on the mounten Jeff’s Peak. I think you will way differently than when your home because if the austrinauts are floating around then why aren’t you floating with them? The altitude is higher on a mountain and the higher the altitude the more harder it is to breath and you get out of earths orbit and the low gravity adventure begins. I think you would weigh the same, but you won’t feel the same weight. I think you will weigh around 100 because you are barely in Earth’s gravity field. I think you will weigh 100 because of less gravity and you lost weight going up Jeff’s Peak.! I think your weight will be less than others! You would weigh the same but, you would feel lighter, because there isn’t as much gravity as there is on the solid ground. I thought was is you or weight does not make a different if you on a bathroom weight measurer and if you are in space it the same most people think that you are lighter in space but you just no gravty so you think you are lighter but you not. I think you weigh 140 because,when we were talking about weightlessness and we said that you may think that you have no weight but you actually weigh 10 pounds less. So if you are in space say you weigh 100 pounds you weigh closely to 90 to 95 pounds. I think you weigh less because you are top of a mountain. I think you weigh less because if u are in space there is less gravity so you free fall so that makes you weigh less. I think you weigh 140 because earth still has a gravity effect on the space station.you weigh 10 pounds less in space. I think you weigh about the same because on earth you way way about 105 and in space the thing that weight you it will float but when you step on it and it goes down it will give you your weight and to not float up you need to grip onto something for it to calculate your weight. I think you weigh a little bit less because if you weigh 100 pounds you weigh 10 pounds less then what you Actually weigh. I think you weigh very little because space has microgravity so you will weigh 90% less than what you did on Earth. I think you will weigh the same because on the mountain the earths gravitational pull is still keeping you down so you will have the same weigh. I think he will weigh the less than he was in his bathroom for instance you weigh 10 percent less than what you weigh on Earth at the same time 90 percent of what you weigh in space which means you will have micro gravity. I think you weigh 10% less because you in space and the gravity making you float and your and gravity is not pulling you down and putting its not putting pressure on your body. I think you weigh very little because in space you weigh less. I think you weight the same but you just feel Weightless because you will lose 10% less up in space. I think you weigh 45 because how high you are. I think you weigh 44 pounds because if you were on a mountain that big and high i eastmate it would be 44.